Most touring theater productions that we've had a chance to watch were through Lunchbox Theatrical Productions. So I was a little surprised to find out that the touring show of Sister Act was by another group, this being Troika Entertainment. But I've always had a soft spot for the movie this musical was based on we went ahead and booked tickets. 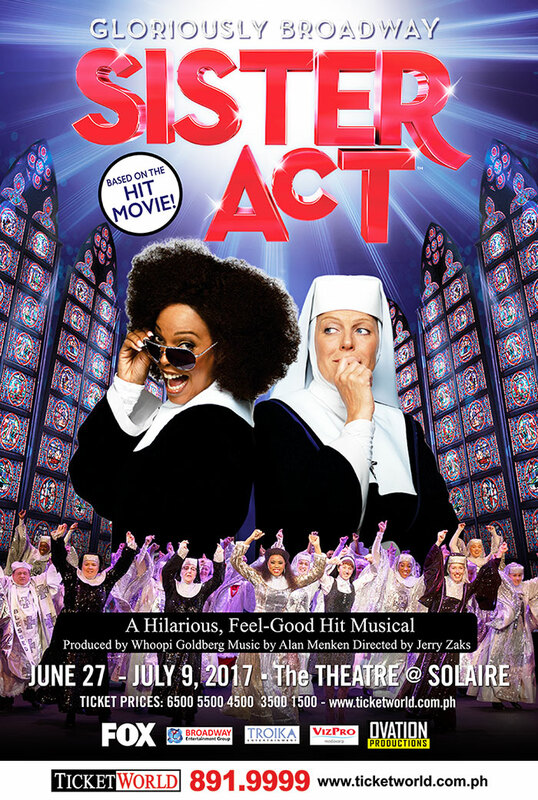 This stage musical of Sister Act naturally features an expanded story to provide more material for additional musical numbers as the narrative of the movie was pretty straightforward and one-track. A good musical tries to explore a few other character arcs and they clearly tried to do that here. I was a little surprised to find out that the musical was not able to retain the rights for the songs used in the original movie. I understand that there are additional costs for that sort of thing versus crafting original music but then the movie was clearly associated with certain songs like "My Guy (My God)" or "I Will Follow Him" to name a few. Synopsis: Sister Act is a musical adaptation of 1992 movie of the same name. The music was written by Alan Menken with lyrics by Glenn Slater and book by Cheri & Bill Steinkellner. This production was directed by Jerry Zaks and was staged from June 27 - July 9, 2017 at The Theatre @ Solaire. Deloris Van Cartier (Dené Hill) hopes to become a lounge singer at her gangster boyfriend Curtis' (Brandon Godfrey) night club but he insists she's not quite ready. Feeling that she's not getting anywhere with her singing career, she decides to tell Curtis that she's leaving him but ends up accidentally walking in on Curtis shooting someone they think has ratted them out to the cops. Deloris leaves and makes her way to the police to report the murder. The desk chief, Eddie (Will T. Travis) turns out to be an old school mate and he asks her to testify as long as he can keep her safe until the trial. Thus he ends up bringing her to a convent The Holy Order of the Little Sisters of Our Mother of Perpetual Faith run by the Mother Superior (Rebecca Mason-Wygal) and Monsignor O'Hara (Kevin D. O'Neil). Neither Deloris nor the Mother Superior are happy with this arrangement as Deloris doesn't fit in with the rest of the nuns and the Mother Superior's rules are pretty severe. But it's the only way to keep her safe from Curtis and his goons. To preoccupy her time better, the Mother Superior assigns her to sing with the tonally-challenged choir. What I Liked: While the music was different, there were some great numbers that were pretty well thought-out such as the key theme of "Take Me to Heaven" and how songs like "Fabulous, Baby!" were re-used to depict different parts of Deloris' life as she grows as a character. I was similarly interested in some of the expanded material created for the stage play, particularly the arc for Eddie the desk cop so he's not just the one who sets up the witness protection deal. There's a lot of unexpected singing and dancing through the play, as best seen in the trio of goons that work for Curtis. Their interludes are rather tongue-in-cheek but they're pretty fun for the most part. And there's the somewhat moment of irony when the convent choir sing a number upon Deloris joining them even though in other scenes they're still terrible and tone deaf. It all works when it comes together. What Could Have Been Better: There were an odd number of technical problems with this local staging of the show despite the venue. Sound levels for the mikes were all over the place with lead characters being overly loud and back-up singers hardly audible. Lighting was wrong with many scenes oddly in shadow with the lights toggling on an off instead of fading in and out. And for the Saturday night that we watched, it seemed like the production only had one spotlight to cover the entire stage. And so there were scenes with blocking that involved two key characters at opposite sides of the stage and only one of them with light. And I can't stress enough the disappointment over the lack of songs made popular by the movie. I wasn't expecting the whole soundtrack but even just one song would made a world of difference. This is a musical based on a movie so you expect certain things to carry over. And the original Sister Act wasn't exactly a straight up comedy - it was a movie with some great musical numbers. And not having some of that in the movie was quite the disappointment. TL;DR: Sister Act the musical is an interesting adaptation of the original movie but one that also feels quite distinct as a creative work. I just really wish that the technical problems weren't so noticeable as it really got in the way of enjoying the show. Thus the play only gets 3.5 colorful, sequinned nun costumes out of a possible 5.